There's a baffling range of smartphones out there with many variations on each model, not to mention the different price points. Should you buy a top-range device has features worth boasting about? Or would that just be a frivolous expense? Here's what you should ask yourself when choosing whether to buy a flagship phone or not. There’s no ‘simple’ answer to this question as it’s a subjective issue, the need (or simple desire, depending on the situation) differs with each person’s expectations. Everyone can spend their money how they want, of course, but it's good to take some time to evaluate the criteria for your purchase. Generally, you'll only get a top-range device (often called a ‘flagship’) if you want the best smartphone around in all aspects. This doesn’t mean that mid-range devices are bad by any means. For example the Samsung Galaxy A8 (2018), for example, is a mid-range device with excellent battery life that will last longer than many more expensive options, even if it lacks some top-end features. Generally speaking, it’s worth buying a flagship if you’re looking for at least one of the following aspects. ... you want to take high quality photos, videos and sound recordings. Flagship phones have better hardware (better aperture, more powerful sensors, etc.) and software than mid-range devices. This means higher quality photo, videos, and audio can be captured. Photo quality in particular is a fierce competition for the latest flagships, and each company tries to tackle this in different ways. For example, the Huawei P20 Pro's triple rear lens setup, or the Pixel 2 XL's fantastic software optimization on its single rear camera. It’s often underestimated but sound is also an important element for a flagship device. It goes without saying that sound quality is generally excellent on top-range devices, even though the device’s loudspeaker has limited importance to the user as they can connect the device to a speaker or a Bluetooth headset. But let’s not forget the importance of the microphone for audio and video recording. If the recording quality is poor, so will be the audio quality. However, the screen resolution and sound quality are generally better on flagships than on mid-range devices. ... you want the latest looks and design trends. We’ve already touched on subjectivity. What is an attractive smartphone? In your opinion, at least. Is it a smartphone that looks like an iPhone? Something that looks more unusual and stands out? Will you accept a screen notch, or do you find it offensively ugly? How about a physical home button? 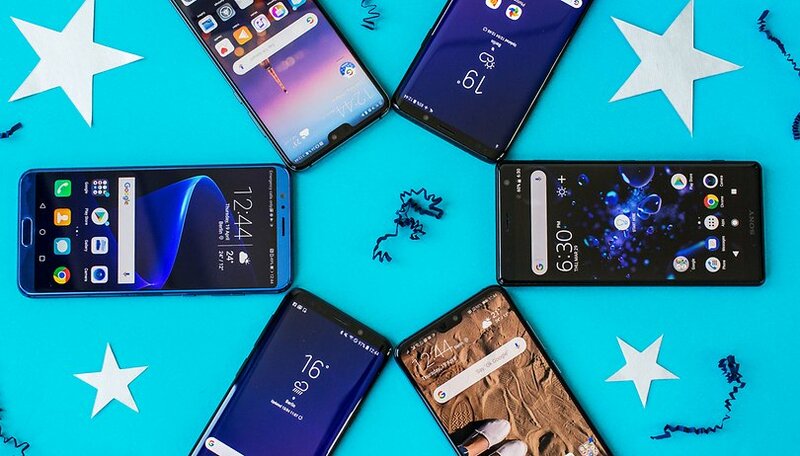 Everyone has their own answer to these questions but one thing is for sure: as a general rule, flagships look more attractive than mid-range devices. Recent trends for smartphones tend to appear on flagships first, so if you want the latest in sleek curves, premium materials, exciting color finishes and so on, it's the manufacturer's flagships you want to go for. These devices are meant to present the manufacturer's top-level craft and design philosophy, and serve as status symbols and fashion items as well as high-performing machines. ... you want to play high-end mobile games (including VR). Let's stop being shallow. It's the inside that counts. Flagships have the specs required to run any app, including demanding modern mobile games with impressive graphics. Unlike mid-range devices, top-range smartphones have the newest chipsets such as the Snapdragon 845 or, the Kirin 970, better GPUs and more RAM. With competition from specialized gaming phones, mainstream flagships are also highlighting their gaming power, as is the case with the upcoming Samsung Galaxy Note 9, which has Fortnite for an exclusive period. Flagships were also mandatory for VR fans that wanted something compatible with Samsung Gear VR or Google Daydream headsets. But now that we standalone VR headsets like Oculus Go, this will become less of a consideration in smartphone purchases. ... you want up-to-date software. This is an infuriating topic, especially if you ever have to debate with iPhone users. Android is extremely fragmented and many devices lag behind on old software versions. In general, the most certain method of getting the latest software version is to buy a new device because it will have it by default. And even afterwards, manufacturers prioritize their recent flagships when it comes to providing updates. When you buy a flagship, you invest a sum of money that will guarantee (in theory, at least) that you’ll have continual updates for new software versions. Well, with most manufacturers, you’ll have to wait several months to get the update but that’s better than most of the entry-level devices and mid-range devices that, in general, never get the latest update. ... you simply want the best. There are those of us who always feel like we need the best of something. For technology fans, this means we just can't bear not investing in the fastest or most modern machine and that holds true for smartphones too. If that’s what you want, or if you just want to impulsively treat yourself, perhaps you should opt for a top-range device. ... you don't demand much from your device. Do you only use your smartphone for a few basic functions? Perhaps you only use your phone to make calls, chat on Messenger/WhatsApp from time to time, take a few photos (without worrying too much about quality) to show to friends or for social media. Maybe you would never want to watch Netflix or HDR video on your phone anyway. If you have limited uses for your device, a top-range device will meet your expectations but it's a waste of money if you're not using most of its features. A mid-range device would probably be enough for what you need and leave you with more money in the bank at the end of the day, and a longer battery life to boot. ... you don’t care about Android updates. If you have limited uses for your smartphone, you’re probably not interested in the latest updates. A lot of people don’t feel they really need new features, such the new gesture controls or Digital Wellbeing tools coming with Android Pie. The geeks among us may always get excited if our phone can do a new trick, but in many cases the use is situational and if you're not a power user, you can do without these features and stick with the most popular apps. Updates are also useful for security reasons, of course, but this isn’t a priority for everyone. ... you prefer to watch video through your tablet, PC or TV. In theory, you can watch films on any device that supports a multimedia reader or a streaming app. With that said, the more advanced the device, the more pleasant an experience you’ll have: with a flagship device, you’ll have much more storage memory for your multimedia, better stability (you don't want an app that crashes in the middle of the movie) and, of course, a generously sized display (minimum of 5 inches diagonal), modern enough to offer excellent quality. A casual glance around public transport will confirm that nowadays watching Netflix or other video content on smartphones is becoming more an more popular, thanks to larger and more advanced displays trickling down to the mid-range segment too. The best video experience will always be on flagships, but if the idea of watching video on a phone instead of a TV or PC monitor is still unthinkable to you, perhaps buying a flagship seems a bit pointless. ... you have a limited budget. Let's get real and talk about money, which is always the main reason not to choose a flagship, especially since new flagships seems to be getting ever more expensive with every generation, even breaking the $1000 mark for certain brands. Premium features demand premium prices, so you have to consider the return on your investment: will you get decent use out of all the high-tech components you're paying for. Even among flagships prices vary considerably. The OnePlus 6 basically offers flagship level specs and performance for under $600, the Honor View 10 also comes just shy of flagship quality on all counts and is only $430. Another option would be to bargain hunt for previous generation flagships. For example, you can get a Samsung Galaxy S7, that originally cost around $700, for less than $300 today, or an S8 for under $500. Of course, once a flagship's price drops, it’s often outdated in one or several aspects, such as design, specs or software updates. What are you considering for your next smartphone purchase? Do you usually buy flagship phones or have your eye on one now? Or do you prefer to avoid them?